Depending on the size of your business there is a huge amount of importance of teamwork in the workplace. In my line of work, I’ve had the benefit of talking to Fortune 500 businesses as well as businesses with 2-5 employees. With that said, no matter what size of business, teamwork is extremely important to the success of a business and I want to share my top six with you…. Brings new ideas – businesses will always need new, fresh ideas to stay competitive in the workplace. The more diverse the team, the better the ability is to bring unique ideas to the table. Teamwork helps to solve problems – when you have difficult problems they can’t always be handled by one person. That’s why collaboration with a team that can exchange ideas to facilitate an answer. It’s supportive – any time you have a team their abilities will vary from one person to the next. That’s why when you have a team with various talents it allows for others to pick up the slack if one member falls behind. Builds trust – As an owner of the company, it’s your job to hire individuals to believe in your product/brand. They must also believe in your vision and mission. Relying on other people builds trust, and teamwork establishes strong relationships with coworkers. Trusting your teammates also provides a feeling of safety that allows ideas to emerge and it helps employees open up and encourage each other. Teaches conflict resolution skills – Anytime you have a group of people working together, conflicts inevitably arise. Employees come from varied backgrounds and have different work styles and habits. While these unique viewpoints create the most successful work, they can also generate resentment that quickly turns into conflict. This ultimately happens because if one person’s ideas aren’t shared amongst the group, frustration can arise. In the end, teamwork in the workplace offers the company and staff the ability to become more familiar with each other and learn how to work together cohesively. 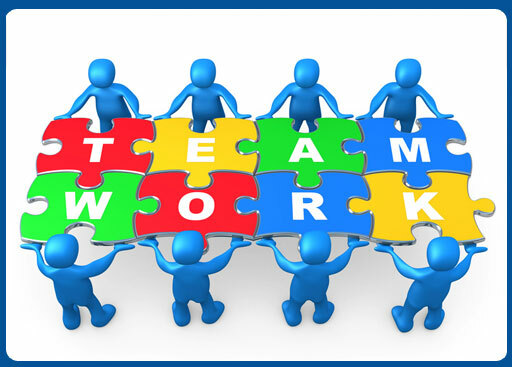 The importance of teamwork at work is vital to the success of the company and to the development of each employee. If you should have any questions on what was stated above, please let me know and if there is subject you want me to discuss in the future please let me know. Thanks for reading, I hope you enjoyed!